Sir Peter Lampl says that a new Sutton Trust/Ipsos Mori poll highlights cost concerns among the next generation of university students. Earlier this year, the Government breathed an audible sigh of relief as university applications appeared to rise again after falling off in the first year of higher fees, although they are still not at 2010 levels. But a new Ipsos Mori poll for the Sutton Trust suggests that ministers may have been a little premature in taking too much comfort from the latest UCAS data. The poll shows that two thirds of school children worry about the cost of going to university. Only 7 per cent of the 2600 11-16 year-olds polled said they had no concern about the cost. At the same time, aspirations remain as high as ever. More than four in five young people say they are likely to go to university, even though in reality the proportion of 18-30 year-olds who do so is still less than half. 38% of young people say they are very likely to go to university when they are older, and 43% say they are fairly likely to do so. This is the same proportion as last year when the same question was asked. Two thirds – 65% – of all the young people polled had significant concerns about university finance which break down as follows: 28% were concerned about tuition fees; 19% were concerned about student living costs and 18% were concerned about lack of earnings while studying. And although 67% of young people said the most important consideration when deciding whether or not to go to university would be their exam grades, 17% said it would be the cost of going to university, with students from the least affluent families (23%) more likely to cite cost as the biggest consideration than those from the most affluent families (14%). So, despite high aspirations – and a realistic sense of what they might need to do to realise them – nobody can argue that most young people aren’t still worried about the cost of higher education. It’s hardly surprising that they are worried when graduates face debts of over £40,000 with fees of £9000 a year for most courses. The truth is that young people are caught between a rock and a hard place. They know that they still need a university education to get on in life and get a good job. For all the talk of falling graduate premiums, a degree – especially one from a good university – still brings a substantial income bonus. And as Sutton Trust research showed earlier this year, a postgraduate degree is increasingly important, and brings with it an additional substantial premium. And even if graduates may be finding it harder to gain an immediate job after university, their long term prospects remain brighter than for non-graduates. But the canny teenager knows something else too. He or she knows that a degree comes with a much higher price tag than ever. Where this year’s graduates might be paying off their student loans into their thirties, those graduating from 2015 onwards will be paying back right into their fifties. There may be some lower up-front costs, but a £40,000-plus debt with interest rates of up to 3% over inflation a year means that those repayments could impact on whether or when to buy a house or have a family. We’ve asked the Institute for Fiscal Studies to look into the implications of these debt repayments and to model the likely impact on important life decisions. They will report later this year. But I think there is something else the Government could do now to ease the burden on low and middle income graduates in the future. They should means-test the tuition fee – as happened from 1998-2006 when fees were first levied on undergraduates – in the same way that the maintenance grant is already means-tested. As I noted in an earlier post, this is already commonplace in the United States. Given that the Government already expects to write off a third of its loans – and some observers think they will have to write off much more – this need not be a particularly costly option. But it could start to allay the fears of debt that face all too many of those who should become tomorrow’s students. That would be a real investment in the future. There are some meetings which will live with you for a lifetime, some which give you a renewed conviction for your work and for life in general. 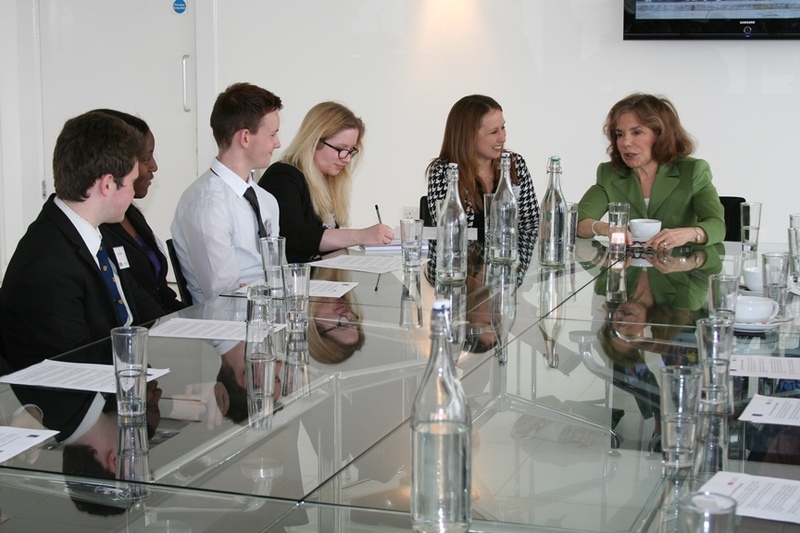 Last week we were fortunate enough to host a round-table with Theresa Heinz Kelly – businesswoman, philanthropist and wife of the US Secretary of State, John Kerry – for participants on our US university programme. For many of us, this was one such meeting. Mrs Heinz Kerry found time in her hectic London schedule (she’d flown in the day before from Istanbul and was heading home the day after) to spend over an hour talking to our students – asking them about their own university choices and offering them advice on education and career paths. The conversation ranged widely; Mrs Heinz Kerry also gave us tantalising glimpses into a whole range of areas of her academic, philanthropic and professional life, from her efforts to combat apartheid in South Africa to her concerns for the environment. Wisdom and common sense peppered her remarks, and the consensus was she was an impressive and inspiring lady. 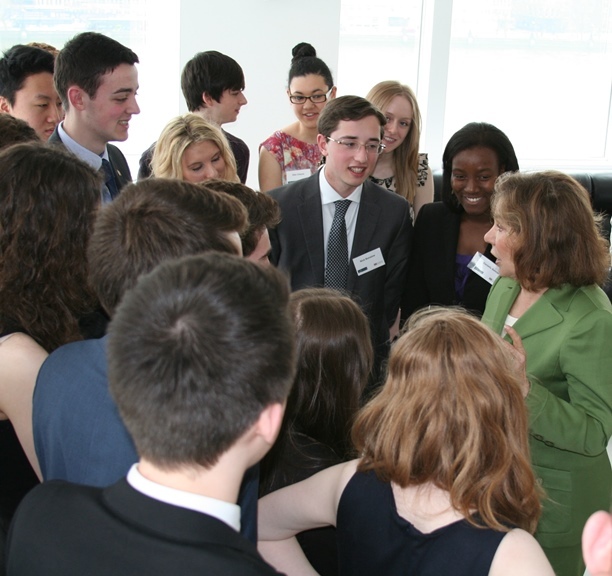 As the discussion closed, and Mrs Heinz Kerry was saying goodbye to the students, I reflected that this has been an extraordinary journey for the Trust, our partners the Fulbright Commission and, of course, for the young people who have been on the Sutton Trust US programme. Eighteen months ago we were sitting in Millbank Tower planning the initiative – tea for us Brits, Diet Coke for our American colleagues – asking just what could be achieved by a non-profit in such a competitive space, and wondering whether more than a handful of our students would be successful in gaining admission. 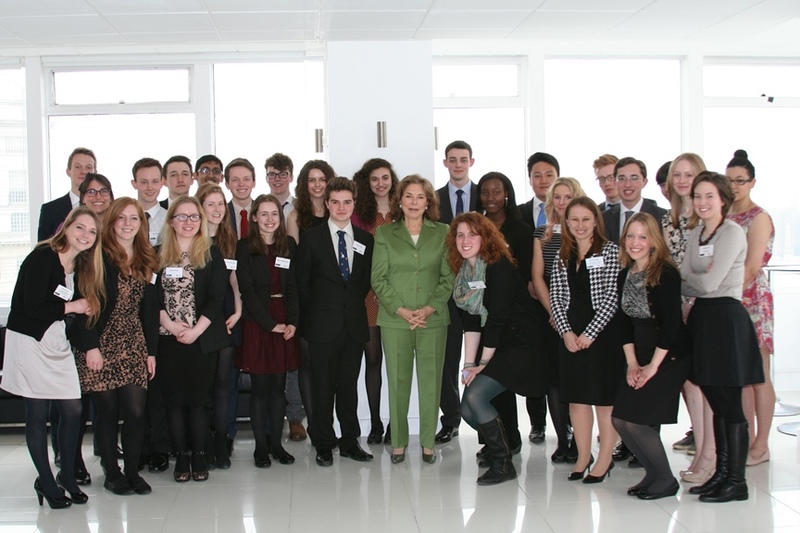 Yet here we were, in Millbank Tower again, almost 20 of our students bound for US universities this autumn, accessing millions of dollars of aid, with one of the most influential women in the world taking a genuine interest in what we’ve achieved. For the young people themselves, many had never seriously thought about studying in the US until they saw our programme – and even then, it seemed a very distant prospect indeed. But, thanks to the exceptional efforts of those involved in running the scheme and their own sheer hard work, we now have ordinary (in the best sense of the word) state school students heading to some of the highest ranked US universities in the world. The don’t live in million pound houses or attend elite schools; they simply have talent and motivation and that has shone through. It is a high bar we have set ourselves for this year’s group of 150, who we’ll be taking to MIT and Yale in the summer. But having met many of those young people over Easter at our selection residential, I am confident we have a great starting point for this year’s programme. There were some exceptional young people with some incredible stories, a voracious appetite for learning and for expanding their horizons. In fact, it wouldn’t surprise me if, amongst them, we have some future leaders of the likes of Mrs Heinz Kerry.